These are web design blogs dedicated to best practices and helping you figure out what you can accomplish. Many of these blogs are also more general in terms of web design topics. 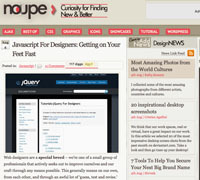 A List Apart is one of the premier web design blogs. Plenty of inspiration and the latest information on best practices. Fuel Your Creativity holds interesting discussions on items related to web design, as well as providing good examples and helpful hints. Just Creative Design provides a portfolio of interesting work, as well as information on bettering your web design practices. Noupe offers a number of great posts on best practices — as well as the worst practices and things you should avoid. Web Designer Wall has a number of examples of best practices in different web design areas. Vandelay Design offers a number of posts and examples on good design and helps you identify best practices. David Airey is a graphic designer with a great blog on design and best practices. Apples to Oranges focuses on different practices and provides inspiration for web design. Unmatched Style provides galleries and good examples of design that works. Also includes podcasts on best design practices. Stopdesign looks at different aspects of the web design world and shares insight into practices. 24 Ways is an interesting concept in blogging. It’s an advent calendar updated every December with all sorts of design goodness. The archives provide great educational insight. The Design Cubicle offers insight on how to run a successful design business. Also includes information on best practices and resources. Creattica Daily looks at news and information from the design world. While these blogs do concentrate on design aspects, they also focus heavily on providing helpful tricks and tips to improve your web design ability and use various tools. Smashing Magazine is home to a plethora of helpful tips and tricks. From tips for help with HTML5 to information on Photoshop plugins, you can find useful design hacks. SitePoint has a blog that offers a number of design hacks and tricks that can help you find faster ways to be more effective. Woork offers a number of quick tips and code tricks to help you with better web design and development. CSS Tricks is a great place to head if you are looking for some CSS design hacks. Web Design Ledger keeps you updated on the latest tricks for making web design a little bit easier. BittBox offers a number of helpful hints and features “free texture Tuesday” within interesing — and realistic — design elements you can add to your web design. Line25 provides information on helpful design tricks and tools you can use to improve your look. 1stwebdesigner has a number of helpful tips and tools for your web design needs. Includes typography tools, as well as information on finding icon sets. In the Woods provides tips that can take your design to the next level. The Design Superhero offers a number of useful tips and tricks to improve your web design — and make it easier on you. SpoonGraphics has a number of helpful tips and ideas for better web design. Simple Bits offers interesting tools and tips for effective web design. These blogs go beyond offering tips and tricks to providing in-depth how-to and tutorials. Many of these blogs offer handy guides to web design elements and can help you seriously enhance your skills. Six Revisions offers a number of helpful guides, including one on using FirePHP for logging and benchmarking. A number of other tools and inspirations are also available. Nettuts provides a variety of tutorials and guides that can help you learn more about web design. Sharebrain has tutorials and guides about a variety of web design needs. Very educational for both the beginner and the pro. Tutorial9 provides access to and information on some of the best web design tutorials and guides out there. DesignM.ag includes a number of helpful tools and guides in helping the web design community to its job better. CSS Vault offers in-depth descriptions of different CSS techniques that can help your web design. Boxes and Arrows offers interesting insight into design, and provides how-tos and tutorials that can help you learn more about better design. MyInkBlog provides helpful guides on a number of design aspects, from Photoshop blend modes to choosing a web hosting company. creative briefing looks at different ways to enhance design through helpful guides and how-tos. Vector Tuts offers in-depth tutorials for vectors and for Adobe Illustrator. Very helpful for learning web design. SylizedWeb offers design tutorials and other educational hints for the budding — and professional — web designer. Speckyboy Design Magazine has a number of tutorials and helpful hints focused on web design. These are blogs that focus on development. You want help developing web sites for yourself and for clients in ways that are user friendly and that provide a pleasing look. ColourLovers focuses on using color in your web design. Very interesting and inspirational for those looking to add something to their web development skills. Devlounge is designed for web developers. Helpful and insightful posts on various areas of Web development. We Function focuses on icons and other functional items that help in web development. Great design ideas and integrations as well. SmashingApps provides a number of useful development tools and tricks for developers. Includes content management help, as well as design tools. Design Melt Down helps you with development, as well as identifying and fixing problems in web design. Design Shack offers a number of helpful posts on development and design, inlcuding using Ajax and integrating with Google. mezzoblue provides insight into fixing problems and other developmental design issues. Ajaxian is a web design and development blog focused on Ajax and incorporating it into your web design. UX Booth offers information on user experience that can be very helpful from a development standpoint. Webdesigner Depot looks at different tools you can use to improve design and development. 456 Berea Street explores different development issues. There is a helpful emphasis on designing with and for Macs. Snook offers development tools that can help you improve your web design. CSS Globe is aimed at designers and developers looking for the latest CSS news, articles and tutorials. Designer City, USA, located off the last exit on the information superhighway, is the must-visit destination for learning about tips, tricks, and hacks from all over the web.